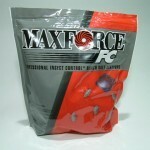 PRODUCT DESCRIPTION: Maxforce FC Roach Bait Stations are all about fast control and secondary kill. 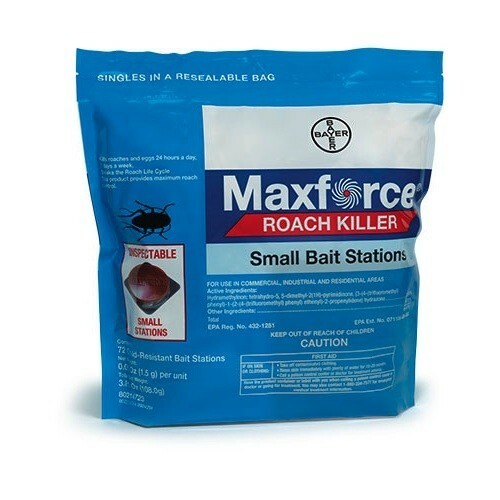 Due to Fipronil and its accelerated Domino Effect™ kill, Maxforce FC Roach Bait Stations start to kill roaches in just eight hours. And field tests show 75% population reductions in just two days for roaches! The bait formula is that irresistible, and works that fast. It's also convenient and easy to use. The small roach bait station bags contain loose-packed single stations and are resealable to keep baits fresh and protected from contamination. Plus, the patented inspectable red station lids now have an additional feature: A debossed lid that's index welded to the base, creating even greater bait station integrity. And, the easy peel-and-stick adhesive makes application fast. Do not spray the bait stations. Avoid placing the bait stations on freshly sprayed surfaces. For effective roach control use 4-6 bait stations per 100 square feet of horizontal surface area. Place adjacent to walls and flush in corners. Do not place more than 24 bait stations per residence. For outdoor use place stations adjacent to structure.